The newest design in my Book Club Girl series! Made to match any book you want! 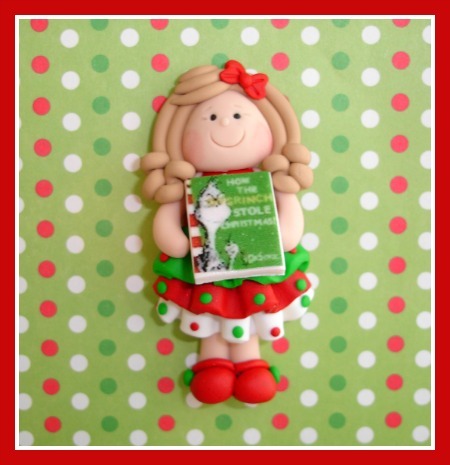 Meticulously handsculpted from polymer clay, this sweetie measures 2 inches tall and is carrying her favorite holiday book, The Grinch Who Stole Christmas! She is decked out in her ruffled and polka dotted holiday dress with matching shoes and hair bow! Please let me know upon checkout if you wish to have me drill holes in her and which direction, horizontal, vertical or no holes for hair bow center.